adjust the seasoning and coat the meat with the sauce. I love this dish, Tandy. It’s interesting to see where it originated. I’ve always spelt it with a ‘ff’, and this is the first time I’ve seen it with a ‘v’. Haven’t made this for the longest time, think the price of fillet puts me off – should try with a cheaper cut. Yum Tandy that does sound good. 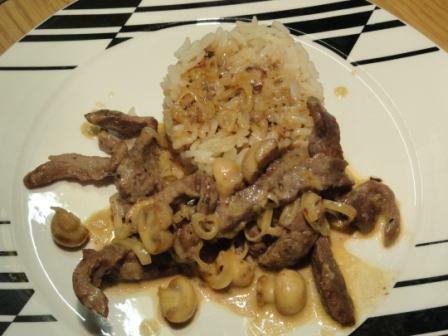 I love a simple mushroom stroganov too. I should try that sometime! This is a perfect dish for this time of year given all of the cool fall nights we’ve been experiencing! Thanks for enlightening me on the roots of this dish. I have been looking for a beef strogonov recipe on various blogs for ages and this one looks delicious. Thank you. I am going to make it this evening.